An Irish Concert At The Monastery! This week we had the joy of attending a 'concert' of Irish hymns and songs covering all the seasons in our lives: from All Saints, to All Souls, Advent, Christmas, Lent, St. Patrick's Day, Annunciation, Eastertide, Ascension and inspiring hymns on the journey of hope to Eternal Life...right here in the guest parlor of our monastery! Thanks to our Novitiate Organ Teacher, Jill Mueller who graciously brought the rehearsal of the concert that will be given to the Nativity Parish Church on Sunday to us so that we wouldn't miss out on this beautiful performance of church songs of Ireland. The two young talented artists were from Ireland: Alexander Harding Bradley and Luke Edward Harding Bradley. Currently, they are both students at Nativity School across the street from the monastery. Alexander is a 13-year-old boy soprano who was trained at Piccolo Lasso in Dublin, Ireland. At 11 year-old, he was invited to join the world-famous Vienna Boys Choir, with which he traveled and sang as a soloist and choir member in concerts throughout Europe, Asia, North and South America, and Australia. When we asked which country was his most memorable one, he mentioned Australia! Luke Edward is a 12-year-old treble soloist, though his voice could go as high as his brother! He was also trained at Piccolo Lasso where he became leader and head boy in 2012. He has sung in concerts and Masses throughout Europe and has performed in several operas, in Sweden, at Westminster Cathedral in London and even for Pope Benedict XVI in Rome in 2012! The concert will be presented at Nativity Church, on 210 Oak Grove Avenue in Menlo Park on Sunday October 26th from 2:00 P.M. to 3:30 P.M. Admission is free, but if desired, contributions may be made to the Nativity Parish Church Music Fund. It is worth your time and will be the most enriching event spiritually and culturally. One of the most obvious sign of the Dominicans' love for Mary is the Rosary that we wear on our side. Our devotion to Mary through the daily recitation the Hail Mary or the Angelic Salutation can be traced back to the beginning of our foundation when our Blessed Mother gave the Rosary to St. Dominic as a means of converting the Albigensians and sinners. Following the footsteps of our Holy Founder, each morning when we put on the habit, we reverently kiss this holy weapon that was given to us by our Blessed Mother and beg her to help us in our mission. At Corpus Christi Monastery, upon receiving the habit, the nuns are given a plain Cross without the Corpus on our Rosary to signify that we are on the Cross with Christ, sharing in his sufferings and those of our Blessed Mother, the Queen. This is one of the sacrificial aspects of our Dominican Spirituality - that like our Holy Father Dominic, we would bear sinners, the down-trodden and afflicted in the compassion of our hearts and lives. One day when Saint Mechtilde was praying and trying to think of some way in which she could express her love of the Blessed Mother better than she had done before, she fell into ecstasy. Our Lady appeared to her with the Angelic Salutation in flaming letters of gold upon her bosom and said to the saint, “My daughter, I want you to know that no one can please me more than by saying the salutation, which the Most Adorable Trinity sent to me and by which He raised me to the dignity of Mother of God. “By the word Ave (which is the name Eve, Eva) I learned that in His infinite power God had preserved me from all sin and its attendant misery that Eve had been subject to. “The name Mary, which means ‘lady of light,’ shows that God has filled me with wisdom and light, like a shining star, to light up heaven and earth. “The words full of grace remind me that the Holy Spirit has showered so many graces upon me that I am able to give these graces in abundance to those who ask for them through me as Mediatrix. “When people say The Lord is with thee, they renew the indescribable joy that was mine when the Eternal Word became incarnate in my womb. “When you say to me blessed art thou among women, I praise Almighty God’s divine mercy, which lifted me to this exalted plane of happiness. Let us take great delight in giving glory and praise to God through our love and devotion to our Lady by reciting the Hail Mary throughout the day: for the salvation of the world, for the conversion of sinners, and for drawing forth God's blessings upon our loved ones, those we meet, those who suffer and those who are in greatest need of God's mercy. "All the Angelic Salutations that you have given me are blazoned on my cloak." (Then she held out a portion of her mantle.) "When this part of my cloak is full of Hail Marys I shall gather you up and take you into the Kingdom of my Beloved Son." - Our Lady to Saint Mechtilde. It has been a humbling experience for me to accompany the young women who are at various stages of their vocation discernment and religious formation. These are women who have expressed their deep hunger to pursue God and it is my joy and privilege to walk with these women on this most blessed path of growing in deeper union with God. The love of God and the thirst for the salvation of souls inspire me to consecrate myself totally to God. And the Charisms of the Order of Preachers: prayer, study and community life were the magnets that drew me to the Dominican contemplative life in our monastery. Prayer touches the Divine and the hungry heart can only be satisfied with the nourishment that the Divine alone can provide. The nuns recognize the need to draw forth God's grace by prayer and study as we pray to love the God whom we know, and we study to know the God we love. Community life helps us to hold all things in common so that we can be free for God alone. It is by sacrifices accepted that the contemplative nuns acquire purifying virtues and their faithful love of God is perfected. None of us is perfect, holy or "qualified" to be called to this way of life but Jesus assures us: "You did not choose me, but I chose you and appointed you so that you might go and bear fruit...fruit that will last..."
If you are a single woman between the ages of 20-40 and are seeking a deeper commitment to prayer, reparation and study, contact me at vocations@nunsmenlo.org and I would be very happy to assist you. I hope that you will find many helpful Vocation Resourcess on our website. It would be helpful for you to attend our Discernment Day Jan 2015 to meet the nuns, learn more about the Charisms of the Order, the Monastic life and our life of prayer, or call me at (650) 322-1801 ext. 19 and set up an appointment to just come and see! I also encourage you to consecration yourself totally to Mary and pray the Rosary daily to our Lady who is, as our Holy Father Pope Francis pointed out: "the Woman of the 'yes.' Mary said 'yes' throughout her life! She learned to recognize Jesus' voice from the time when she carried him in her womb. May Mary, our Mother, help us to know Jesus' voice better and better and to follow it, so as to walk on the path of life!" As women of the Word, we can bring forth life to our world dying of hunger for God. If you are touched by the power of God's grace and the Spirit of God calling you to a deeper and intimate union with the Divine, may you heed his voice and draw closer to him by responding generously so that together we may be life-givers to our world, to the Order of Preachers, and to our Holy Mother Church! Be assured of our daily prayers for you before our Eucharistic King and Lord! Have you ever wondered what life is like as a nun? Are you drawn to prayer and have a deep desire for love? In his beautiful meditation on the Glories of Mary, St. Alphonsus Liguori recounted that John Gerson, the High Chancellor of Paris believes that the kingdom of God consists of justice and mercy based on his meditation of the psalm "These two things have I heard, that power belongeth to God, and mercy to thee, O Lord." While the Lord reserved the kingdom of justice for himself, he has given Mary the kingdom of mercy and ordained that all the mercies that are given to humankind must pass through the hands of Mary. This belief was also confirmed by St. Thomas in his Preface to the Canonical Epistles, stating that: "the holy Virgin, when she conceived the divine Word in her womb, and brought him forth, obtained the half of the kingdom of God by becoming queen of mercy, Jesus Christ remaining king of justice." As poor banished children of Eve, it is our consolation and joy to constantly call upon the name of Mary who is our Mother, our Queen, our life, our sweetness, and our hope! It is of no surprise that the Order of Preachers whose mission it is to preach the Word of God for the salvation of souls entrust ourselves very fervently to this tender and merciful Queen through unceasing prayers and each night when we make procession to the shrine of Mary while singing the Salve Regina. The following narrates the vision of how our Blessed Virgin appeared to our Founder, St. Dominic in prayer and revealed her protection over the Order. One night, after prolonging his prayers until midnight, Dominic left the church and came to the dormitory, where he completed what he had come to do and, taking his place at one end of the dormitory, continued to pray. As he stood praying, he glanced at the other end of the dormitory and saw three beautiful women enter, but noticed that the one in the middle was a venerable lady far more beautiful and dignified than the other two. One of them was carrying a beautiful, shining vessel and the other an aspersorium which she handed to the lady in the center, who went from bed to bed sprinkling the brethren with holy water and blessing them. As she went along in this way, she passed by one of the brethren without sprinkling him or blessing him. Blessed Dominic observed this and took note of the brother they had neglected. Then rising from his prayer and walking as far as the lamp which hung from the middle of the dormitory, he fell at the lady’s feet and began to entreat her to tell him who she was, although he already knew. At that time the beautiful and devotional antiphon Salve Regina was not being sung but only recited kneeling, by the brothers and sisters in Rome. When the lady answered, she said to Blessed Dominic: “I am the one you call upon in the evening. 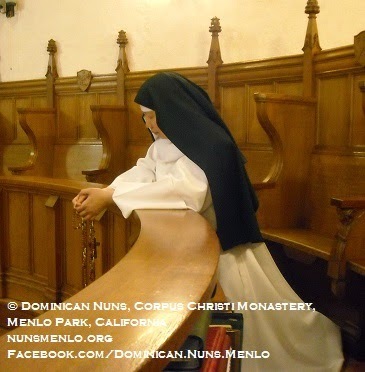 When you say, ‘Turn therefore most gracious advocate thine eyes of mercy toward us,’ I prostrate myself before my Son and ask him to preserve this Order.” Then Blessed Dominic asked her about her companions. “One is Cecilia and the other Catherine,” she answered. After that Blessed Dominic inquired about the brother she had passed by as she had sprinkled and blessed all the others. “Because he was not properly disposed,” she said. After this she continued to sprinkle and bless all the others and then disappeared. When she was gone Blessed Dominic returned to pray in the place he stood before. Suddenly he was rapt in spirit before God and saw our Lord and the Blessed Virgin sitting at his right. It seemed to Blessed Dominic that our Lady was wearing a cape of bright blue, the color of sapphire. As Blessed Dominic looked around, he could see religious of all the orders but his own around the throne of God, so that he began to weep bitterly and stood far away, not daring to approach the Lord and His mother. Then our Lady motioned for him to come near. But he would not dare, until our Lord Himself also called him. Then Blessed Dominic cast himself before them weeping bitterly. 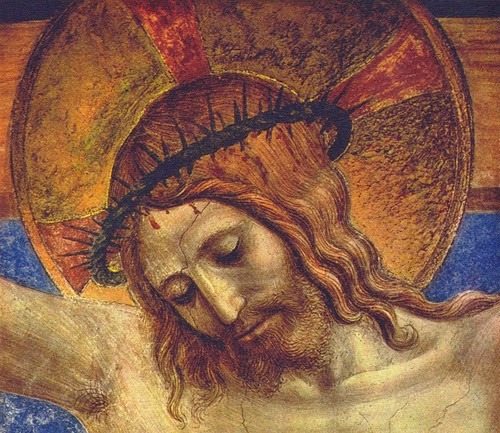 But our Lord told him to rise, and when he did, our Lord asked him, “Why are you weeping so?” “I am weeping because I see all the other orders here but no sign of my own.” And the Lord said to him, “Do you want to see your Order?” and he answered, “Yes, Lord.” Then our Lord, putting his hand upon the shoulders of the Blessed Virgin, said to Blessed Dominic, “I have entrusted your Order to my Mother.” Then he asked him again, “Do you still wish to see your Order?” and again he answered “Yes, Lord.” Then the Blessed Virgin opened the cape which covered her and spread it out before Blessed Dominic, to whom it seemed vast enough to cover the entire heaven and, under it, he saw a large multitude of the brethren. Then prostrating himself, Blessed Dominic gave thanks to God and to Blessed Mary his Mother. After that the vision disappeared and he returned to himself just as the bell rang for Matins. When Matins were over, he called the brethren to chapter and gave them a long and beautiful talk, exhorting them to love and pay reverence to the Blessed Virgin Mary. Among other things he related this vision to them. Feast Day Greetings From The Cloister! A Not-So-Ordinary Summer At The Monastery! 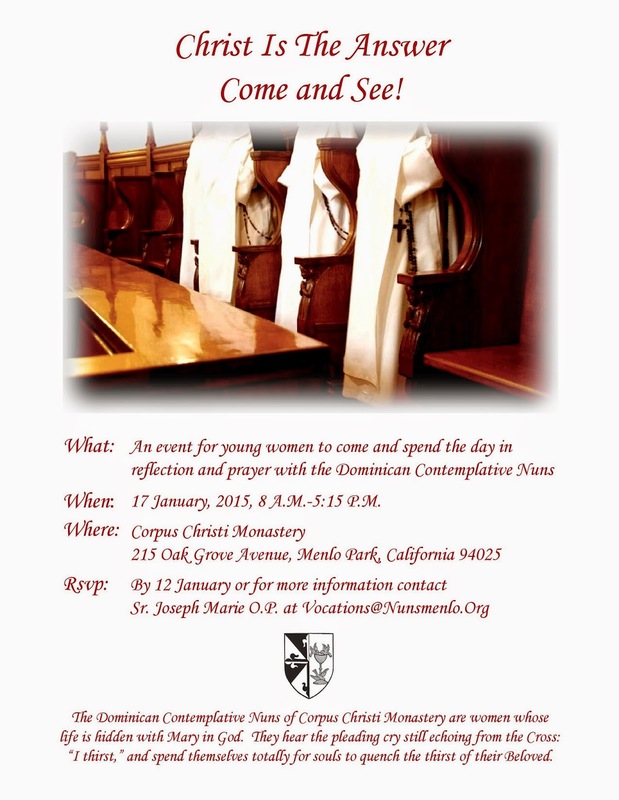 If you have been following our blog and Facebook, you will know the details about our effort to promote a culture of vocations and the exceptional responses we’ve experienced, but for those who have not, it all began with the “Come and See Weekend” we held in January for thirteen young women who came searching to know what God is asking of them. With further contact and interviews, two of these women who came to this discernment weekend and two other women pursued the process of Aspirancy where they had an opportunity to live within the enclosure to further discern their vocation to the Dominican contemplative life in our monastery. The aspirants arrived for First Vespers on the Solemnity of Corpus Christi. Their first day in the monastery began with a beautiful sung liturgy, enhanced by the presence of our Dominican Laity members and eighteen friars in attendance, Procession of the Blessed Sacrament and Benediction. Festivities followed and the aspirants quickly learned about the special spirit of Dominican family that pervades our monastery. This was not the end. Many other women who could not come for the full weekend in January, because of either short notice or previous engagements, continued their contact with our vocation directress Sr. Joseph Marie and repeatedly expressed their need to deeply search and discern their vocation. In response to their request, another mini discernment day was organized. We began with our 8:00 a.m. Mass celebrated by the vocation director of the Western Province, Fr. Steven Maekawa, O.P. After a short break, introductions were made and conferences followed on Religious Life and the Discernment Process, Dominican Monastic Life and Dominican Spirituality. Personal vocation stories followed and a question and answer period. Thirty women crowded into the parlor area for these presentations. We prayed the Office and recited the Rosary together and after a light luncheon, the day concluded with Adoration and Benediction of the Blessed Sacrament. The women were encouraged to have a spiritual director as part of their discernment process. Another important factor is to have a good support system. The inquirers hunger for like-minded companions and treasure the opportunity to maintain a frequent line of communication with our vocation directress. Brother Thomas Aquinas, O.P., a tremendously gifted student brother of our Province, offered to give us three lectures entitled “St. Thomas Aquinas on the Virtue of Religion” as part of our ongoing formation. Besides being a very skilled organist, he is an avid teacher at heart. We continue to live in the “drought” mode, saving water wherever and whenever possible. We’ve had to minimize all planting this year but on the brighter side, this has provided us a new opportunity to custom landscape some areas that needed attention. Thanks to our benefactor crew of Stanford students, they have now taken to heart the task of lightening and brightening our garden area. Thank You Catholic Community of Stanford!